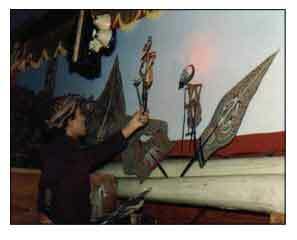 Wayang kulit, (leather puppet shadow play) is a norated drama played by Dalang (puppeter) that tell about Mahabarata and Ramayana epics. Gamelan Pelog and Slendro with sinden (Javanese Singers) accompanies this. This location play in RRI (Radio of the Republik Indonesia) in Jl. Pemuda 82, Surabaya on Saturday night from 08.00 - 03.00 a.m. Anather play at complex mbah ratu grave on thursday kliwon night from 08.00 p.m - 04.00 p.m.